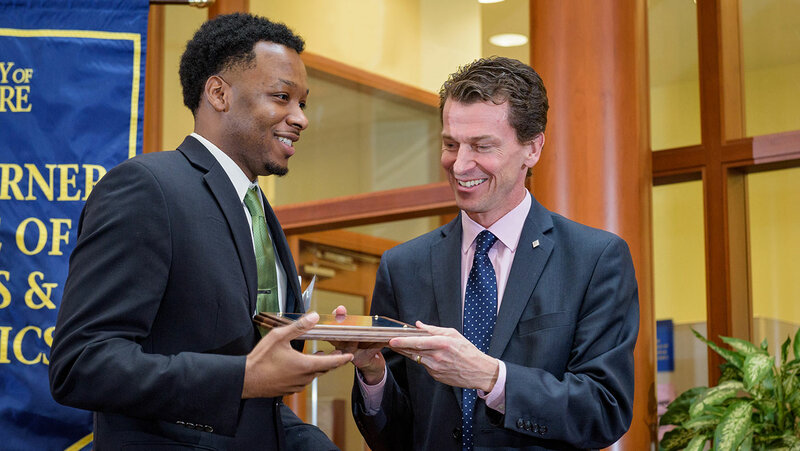 The Carol A. Ammon Case Competition gives graduate student teams the opportunity to create and present recommendations for the competition’s focal company. The teams present their recommendations in two judged rounds. The preliminary round is judged by alumni and friends of the UD MBA program. Judges for the final round include leaders of several regional firms and/or executives from the focal organization. The competition enhances students’ analytical and presentation skills, expands students’ business vocabulary and exposes them to a vital audience of regional corporate leaders. The Carol A. Ammon Case Competition is made possible by the generous support of Endo Pharmaceuticals and named for the company’s founder, Carol A. Ammon. I survived my first case competition - In this guest post, Naomi Wakiaga, UD Lerner master's of international business student, shares her experiences about participating in this year's Carol A. Ammon Case Competition. 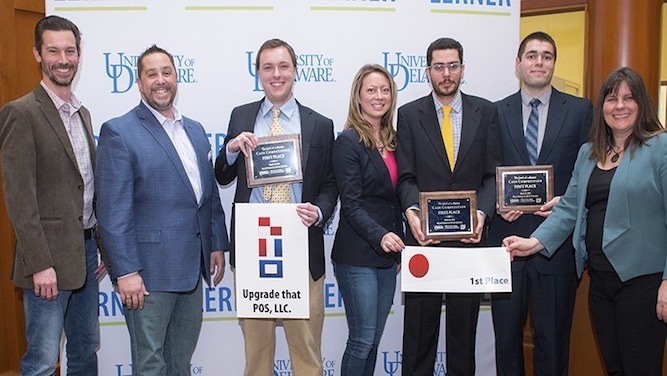 Upgrade that POS takes top honors at 19th Carol A. Ammon Case Competition - Three student teams took the honors at the 19th edition of the Carol A. Ammon competition, presented by the Lerner College of Business and Economics on March 18. This year’s case, titled “Danger on the Horizon: Blue Horizon Dive Center,” focused on a dive center in nearby Glen Mills, PA. Teams are competing for bragging rights and trophies. The winning teams will also share $5,000 in cash. Please become familiar with the rules before submitting a team. All analysis is to be done by members of your team only. All team members must be currently enrolled in a graduate degree program at Lerner College. Teams will consist of three or four students. Team members may use any reference sources/materials in the public domain (i.e. the university library, the internet). If library sources are used, please make copies of the information you need rather than checking items out, so that all participants will have access to the information. Do not contact the company focused on in the case, or any employees of the company. If you happen to know or encounter any employees of the focal company, you may not ask them questions about the company. Failure to follow this rule will result in being disqualified from the competition. No team, nor any of its members, should attempt to gain information on the content of the presentations made by other competing teams. Once an individual participant or team obtains a copy of the competition case, coaching by faculty members, staff, or contact with outside experts is expressly prohibited. Teams will make their preliminary round presentations at the time and location indicated in the case competition timeline. Specific presentation times for each team will be determined by a random drawing held at the time of case distribution. The teams chosen to compete in the final round will make their presentations at the time and place listed in the timeline. Presentation order for the final round will be determined by a random drawing held shortly after the completion of the preliminary round. Printouts of PowerPoint slides and overheads used in the presentation should be submitted to each judge prior to the presentation. You will need 5 copies of slides and overheads for the preliminary round, and 8 copies for the final round. Standardized Windows® laptops and clickers will be available for all teams. Laptops will be loaded with PowerPoint 2003. If you use a newer version, please be sure to save your file as a 2003 file to avoid potential incompatibility problems. Preliminary round presentations will be strictly limited to 25 minutes, followed by a 12-minute question and answer session. Final round presentations will be strictly limited to 25 minutes, followed by a 15-minute question and answer session. Once these time limits are reached, only the current sentence being spoken by a presenter may be finished. Teams are free to determine who and how many team members are involved in the actual oral presentation and fielding of questions from the judges. However, some judges find it odd when there are group members who do not present. Only team-invited guests, competition staff, and judges are allowed to attend the preliminary round presentations. Anyone may attend the final round presentations, except for members of the teams chosen as finalists. Students competing in the final round may attend other finalists’ presentations after their team has presented. Copies of the competition case will be distributed at the time and place indicated on the case competition timeline. Each team should plan to send at least one member to pick up copies of the case (and any additional materials). If you cannot pick up the case materials at the indicated time, you may do so at a later time by contacting the GEP Office. Please note: any attempt to obtain a copy of the case in advance of the scheduled distribution may result in your team’s disqualification. Dress for both rounds of presentations will be business attire. Any additional important rules clarifications will be announced by email and posted as addenda to this document. If you are uncertain about a rule or its interpretation, please email a faculty advisor for the competition. The case involves strategic management issues across a variety of functional business domains (e.g., marketing, operations, finance, MIS, management, etc. ), and deals with current issues facing a focal organization. Regardless of the time frame specified in the written case, the case will be treated as “live,” meaning that any publicly available information that has come to light since the case was written, as well as any historical information not contained in the case, is fair game for use in competition analyzes. In other words, presentations should address the actions that the focal organization should take as of the day of the competition. In the preliminary round, each team will have 25 minutes to present its analysis of the case, plus up to 12 minutes for Q&A. In the final round, teams will have 25 minutes to present and up to 15 minutes for Q & A. During presentations, teams should plan to address: (1) key aspects of the business situation faced by the case’s focal organization, (2) strategic recommendations for responding to the business situation, (3) a convincing rationale for those recommended actions, (4) a plan for implementing recommendations, and (5) a discussion of the measures (or metrics) that will be used to determine the extent to which the recommended actions result in success/failure, especially profit and loss. Teams are free to spend as much or as little time discussing each of these components as they wish; however, all teams are strongly encouraged to consult the scoring criteria listed below to get a sense of how important each criterion is to achieving success in the competition. 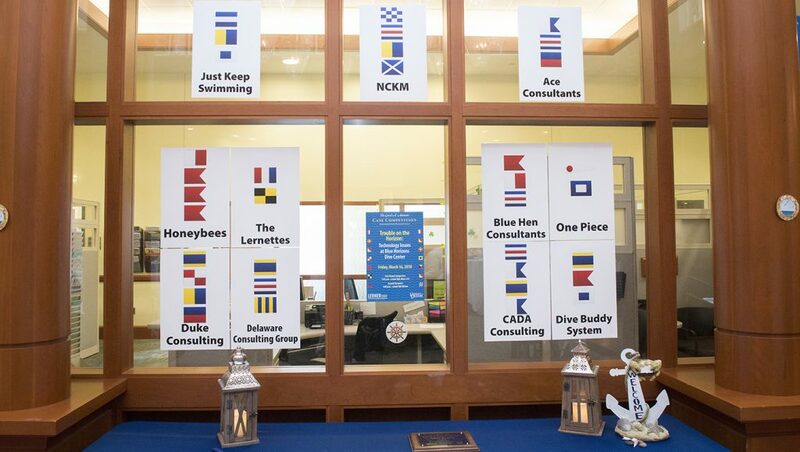 Preliminary round judges will be University of Delaware MBA Alumni. University of Delaware faculty members may also serve as preliminary round judges, if needed. Final round judges will be prominent members of the business community. A preliminary list of final round judges will be posted on the competition website as the competition date approaches. Judges will be encouraged to provide individual, written comments about all aspects of each presentation, so that constructive comments can be provided to participants at the end of each round of the case competition.